Moving Ahead: Meet the man Jazztimes calls the 'thinking man’s vocalist'. In 2010, he is part of the second national tour of Monterey Jazz Festival All-Stars. Nicknamed the MJF/52 Jazz All-Stars because they tested their tour-worthiness playing the 52nd Annual Monterey Festival in September 2009, they also include pianist Kenny Barron, violinist Regina Carter, guitarist Russell Malone and the rhythm section from Barron’s trio –bassist Kiyoshi Kitagawa and drummer Johnathan Blake. The national tour arrives at the Renee and Henry Segerstrom Concert Hall on Saturday, April 24. For an article in the venue’s Revue publication. I interviewed Elling by telephone in November 2009. He was backstage at the Walt Disney Hall, where he would be performing that night. CRISTOFER GROSS. You have received such incredible validation in terms of critical notices that it seems you're on a career path cleared of obstacles by the Divine. Oddly, you were attending the University of Chicago Divinity School when you changed directions and pursued music. Do you recall how you came to make that decision? KURT ELLING. Well, from the inside I never expected to be a professional musician until I was in my early Twenties. I just always sang for the joy of it and the way it made me feel. The only professional musicians I knew were either schoolteachers or church people. Even though I was listening to a lot of jazz records, without heavy contact time with real jazz people, I don’t think it was something I realized people were doing. [Laugh.] I grew up outside Chicago in a great provincial kind of environment, so the context of my interest was church people and classical music and that kind of a thing. I went to graduate school to read the philosophy of religion for three years, thinking that getting a master’s degree was the way it was supposed to go. At that time that I was sitting in a lot [with jazz musicians] and I had really fallen in love with the scene. The older musicians just put their arms around me and said, Man, you come back. You’re with us. GROSS. So they recognized it in you as much as you recognized it in yourself. GROSS. Nobody was recognizing anything over there. ELLING. No. No. I was not a brain. I learned some great stuff and I had some great experiences, but it wasn’t like David Tracy was putting his arms around me and saying ‘My son, my son.’ That was definitely happening in the jazz world though. And I really owe it to those cats for pointing me in the direction of my life, and giving me my life. GROSS. What was the national jazz scene like at that time? ELLING. The ‘80s was the time in jazz of the Young Lions and that whole renaissance, with all those cats starting to come out of conservatories and get known. GROSS. Was the Art Ensemble of Chicago at that time? ELLING. Well that was happening too, but I’m thinking more specifically about Josh Redman, and all the cats that came out around that time who are now the mature pillars of the jazz community. And I was just a bug. [Laughs.] Even though I’m a similar age to them, I was just walking around being dorky. And these cats were already on Verve, making a name for themselves, you know. GROSS. And Josh had a dad who was a major musician, and so real music was in his house, and knowing real music makes a difference. ELLING. Oh, yeah, absolutely. Your parents have got to set up an atmosphere that – as with anything else – if you want to have a kid who loves to read books, then you’ve got to read books and you have to pay attention to books. If you want to make sure he is aware of music and culture and stuff, you’ve got to give ‘em culture and music and stuff. That part of it is not rocket science. You know, [John] Pizzarrelli and I talk about this, and he says that when he was a kid, if he wanted to sit down on the couch, he had pick up a guitar and move the guitar out of the way. So [music] was right there. GROSS. It’s not alien at all. I wonder if this prolonged gestation period before seriously pursuing music let other things have full run of your attention, the biggest winner being your facility with language. Not only in the lyrics you write for vocalese, but other tunes, your fondness for poetry that works its way into songs, and your work with Steppenwolf Theatre Company on the Allen Ginsburg project. There's so much that indicates that your love of language is almost equal to your love of music. Would that be fair to say? ELLING. Yeah, I’d say so. I mean . . . you know, . . . I spent so much time on a search for meaning, or understanding – or you know, a kind of reconciliation with . . . life [laughs], and what we’re about and what we’re doing here –that I naturally developed the frontal lobe a little bit more. And trying to get your head around [Emmanuel] Kant, [Friedrich Daniel Ernst] Schleiermacher and [Georg Wilhelm Friedrich] Hegel, Paul Ricoeur, that’s going to put a thing in your head. And then when I realized that what I was really there for . . . what I was really trying to learn . . . what I was really trying to apprehend, was a poetic essence and not, strictly speaking, an intellectual one. And because of that I have read, you know, a reasonable amount of poetry in [or/and] trying to pay attention to the ways in which great writers – of all kinds – say and imply real elements with the most elegant words, and with the fewest number of words, in the most profound ways. So, yeah, I’ve definitely tried to pay attention to that and you know I like to think of myself as at least an aspiring writer. [Laughs] I’d like to be a writer. I think that would be great. GROSS. Well, you certainly have reason to call yourself accomplished. And the way you insert the John Heynen poem in one of the songs ["Storyteller Experiencing Total Confusion"], is a kind of ballsy thing to do. I mean somebody who was looking at these things would say, Is this going to sell? You obviously don’t do that. You’ve really got a sense of what the art is and you go after that and the fact you’re topping the polls is a great validation of that adherence to an artistic sensibility. ELLING. Yeah, I’ve been fortunate in a lot of ways, when it comes to that. That’s a whole complex area to think about, really. When you think about, can you pull it off? can you make it? does it sell? Especially in this economic climate – the way the music business is just falling apart and everything is disintegrating . . . and reforming, to be honest. It’s not going to be a total dissipation: It’s not Armagedon. It’s just changing. And people haven’t been able to realize the shape of it yet and it freaks them out. So it is definitely an economic challenge to be a jazz person at all at this point, let alone somebody who’s trying to, you know, not just serve warmed-up leftovers. GROSS. Now, regarding the Monterey Jazz Festival Tour, did that grow out the fact that you all did well on stage last year, or was . . .
ELLING. Last year was actually kind of the kick-off of what this tour is. The way it came together was that they have a pretty healthy Artist in Residence thing at Monterey, and there are a lot of teaching components. If you’re the Artist in Residence, I want to say [you go out] twice for longish weekends in that half-year. And then you’re really active at the festival as well. I know Regina has been Artist in Residence, and I’m pretty sure Kenny Barron has been, too. So, if you go back [and look at our individual Festival histories], then it makes sense. So they kind of build this thing over a certain amount of time, and then they get the collection together and they think, that’s an interesting set of instrumentation. It was a little bit more natural instrumentation when Terrence [Blanchard] went out with [James] Moody – ‘cause that’s, you know, trumpet, saxophone, rhythm section, singer. Done. I think we’re going to find that by necessity we’re going to have to be a little more creative with charts and with the way we do arrangements, because the instrumentation is a little unusual. GROSS. I think you’ll find some real magic in there. Speaking of which, how do you choose songs? Is this one of those leave your ego at the door things, or is everybody going to carve up their time? Do you know what you’re going to do? ELLING. It’s in progress. We’ve each sent each other charts. You know, everybody definitely needs to be featured in a certain way. There isn’t really a leader as such. We obviously had to have discussions going into the performances at Monterey and that all seemed to have worked out really well. So, I guess you might call it a collaborative effort. GROSS. I read some notices of the shows at Monterey, and people were really blown away, I mean it sounds like there’s really a there there. ELLING. Ah, man, I hope so. GROSS. One woman, and I have no idea what she’s about, said your singing along with Regina’s violin was almost like two voices. The violin really emerged as a voice. Did you feel that in performance? Have you had that previously with a violinist? ELLING. Well sure. Not for extended tours and usually in the context of a string quartet like on our recent record [Ethel]. But back in the day I was definitely having Johnny Frigo as a semi-regular guest at our gigs over at the Green Mill. There are a couple of other great younger jazz violin players in Chicago that we used to have on. But I can’t say it’s been a regular habit. There aren’t as many people who play jazz violin as there are who play jazz saxophone. GROSS. Or as many who play like Regina Carter. GROSS. With this time commitment to the tour, are you going to be able to pop in any gigs with your quartet during this period? ELLING. No, it’s going to be kind of a three-month hiatus, which is a long time for a quartet to take a break. GROSS. Or works as a trio and discover they don’t need a vocalist. ELLING. [Laugh.] Hey man, if they can pull it off . . . the way it’s going now. No, Laurwence [Habgood, Elling's longtime pianist and arranging partner] and I are going to be writing some stuff and I expect he’ll be taking some of that time to do arranging and write some larger pieces that he’s interested in doing. And, our actual rhythm section is a little more fluid than it has been in recent years. We just don’t have a perfectly set quartet at this point, which is fine. They can go and play with Christian McBride, or Taylor Eigsti or whoever it is that they want to go out with during that time. And obviously they know with enough warning that it’s going to be a while – between February and April that I’m not going to be with them. GROSS. Any story about the state dinner? ELLING. It was, you know, all the stuff that you usually say, but I would say it was definitely a cherry on top to have the President introduce me to his guests as his “homeboy.” I don’t mind that. GROSS. And literally his home is now your home. ELLING. Yeah, I guess that has something to do with it. I was actually doing benefit for Barack when he was running for state senator long before we bought the condo from him, so I won’t say I’m his best friend in the world, that would be incorrect, but we’ve seen each other on and off for a number of years now and it’s a genuine pleasure for me just to be included in his world in that way. GROSS. Well, the last person I interviewed was Esperanza Spalding, and she had played at the White House, so things are looking good for jazz . . .
ELLING. Sure. And Josh Redman and Brad Meldau were just there for the lighting of the Christmas tree. GROSS. Turning to your theater interests: the piece you developed about Ginsberg with the folks at Steppenwolf Theatre sounds like it was pretty successful, going on to the Kennedy Center, and a Philly theater. Are you working on any new projects? ELLING. Well, yeah. I always have other stuff in mind. I’ve been trying to find time in my schedule to write a stand-alone theater piece that is a true piece of staged drama, that also features real jazz musicians actually going. That’s in my mind. I haven’t had the time to do it yet. GROSS. Well congratulations on that, and have a great show tonight at the Disney Hall and a good tour with Monterey Jazz. We’ll see you in Costa Mesa. And thanks for taking the time. ELLING. Yeah, sure. Thanks. I appreciate all the research that went into it. It’s a good interview. KURT ELLING has been nominated for at least one Grammy for each of the eight CDs he has released since his first, Close Your Eyes in 1995. Dedicated to You, his second recording for Concord/Universal, is a respectful revisiting of the landmark 1962 disk John Coltrane and Johnny Hammond. This 2009 release, which includes versions of all six of the Coltrane and Hammond tracks, plus a few other complementary songs, may "propel his career to new heights," according to a Concord press release. Which is not to say his career is hurting. "Elling is an eight-time GRAMMY nominee who has spent the last nine consecutive years at the top of the Down Beat Critics poll and the last four consecutive years topping the Jazz Time Readers’ poll. He has won five Jazz Journalists Association Awards for Best Male Vocalist and the Prix Billie Holiday from the Academie du Jazz in Paris. His quartet tours the world continually, performing to critical acclaim in Europe, the Middle East, South America, Asia and Australia, and at jazz festivals and concert halls across North America. "In addition to leading a regular quartet that features collaborator Laurence Hobgood, Kurt Elling has spent recording and/or performing time with an array of artists that includes Terence Blanchard, Dave Brubeck, The Clayton/Hamilton Orchestra, Benny Golson, Jon Hendricks, Fred Hersch, Charlie Hunter, Al Jarreau, David Liebman, Joe Lovano, Christian McBride, Marian McPartland, The Bob Mintzer Big Band, Mark Murphy, John Pizzarelli, Kurt Rosenwinkel, and The Yellowjackets. He has written multi-disciplinary works of art for The Steppenwolf Theater and by commission for the City of Chicago. 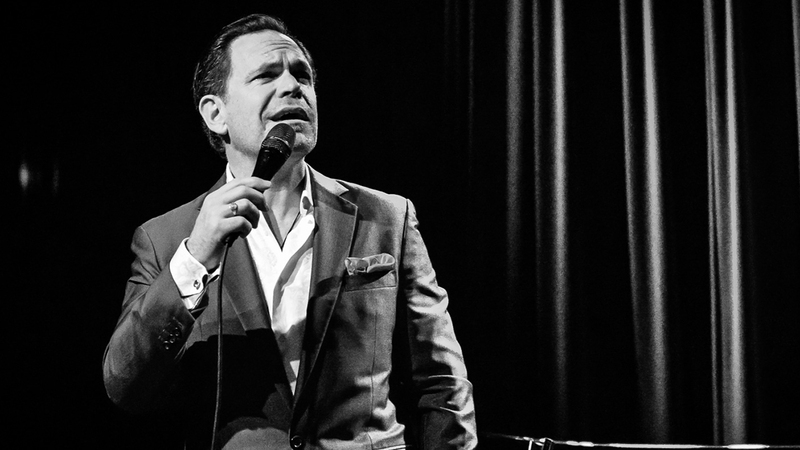 Kurt Elling is a former National Trustee and National Vice Chairman of the National Academy of Recording Arts and Sciences (The GRAMMYS) and has been artist-in-residence for the Monterey Jazz and the Singapore Music Festivals."